بالا بودن سطح آب زیرزمینی در مناطق شهری باعث بروز مشکلات متعددی در سازه‌های موجود و پروژه‌های عمرانی می‌شود. در روش مرسوم زهکشی با حفر تعدادی چاه و پمپاژ آب از آبخوان، سطح ایستابی تا مقدار مطلوب پایین آورده می‌شود. علی‌رغم کارایی قابل قبول این روش، هزینه اجرایی آن غالباً زیاد است. بنابراین بهینه‌سازی طراحی سیستم پمپاژ آب زیرزمینی در این‌گونه پروژه‌ها حائز اهمیت بوده و می‌تواند باعث صرفه‌جویی چشمگیر در هزینه‌های نهایی شود. در این پژوهش، حل مسئله جانمایی و ظرفیت بهینه چاه‌های پمپاژ با حداقل هزینه زهکشی و به‌منظور افت سطح آب زیرزمینی با استفاده از رویکرد شبیه‌سازی- بهینه‌سازی مد نظر قرار گرفت. مدل شبیه‌سازی مورد استفاده به‌منظور بررسی رفتار آبخوان تحت تأثیر احداث چاه‌های پمپاژ نرم‌افزار MODFLOW و الگوریتم بهینه‌سازی به‌منظور تعیین جانمایی و ظرفیت بهینه چاه‌های پمپاژ الگوریتم کرم شب‌تاب می‌باشد. مدل توسعه یافته FOA-MODFLOW بر روی آبخوان محدوده مسجد جامع شهر کرمان به‌منظور طراحی و جانمایی بهینه چاه‌های پمپاژ آب تحت هدف کمینه‌سازی هزینه کل طرح اجرا شد. نتایج به‌دست آمده حاکی از آن است که در محدوده مذکور، ضمن کاهش قابل توجه هزینه طرح نسبت به طرح پیشنهادی توسط مشاور پروژه، می‌توان با احداث دو حلقه چاه با مجموع نرخ پمپاژ 5503 متر مکعب در روز، به‌میزان حداقل 5/1 متر در محدوده مذکور افت ایجاد کرد، در شرایطی که میزان نشست زمین در محدوده طرح نیز در حد مجاز باشد. همچنین بررسی تأثیر پارامترهای مهم حاکم بر مسئله بیانگر تأثیر مقادیر حداکثر رقوم مجاز سطح آب زیرزمینی و حداکثر دبی پمپاژ چاهها بر روی جواب‌های مسئله می‌باشد. از طرف دیگر نتایج، عملکرد مناسب رویکرد شبیه‌سازی- بهینه‌سازی مورد استفاده در حل مسائل آب زیرزمینی را نشان می‌دهد. 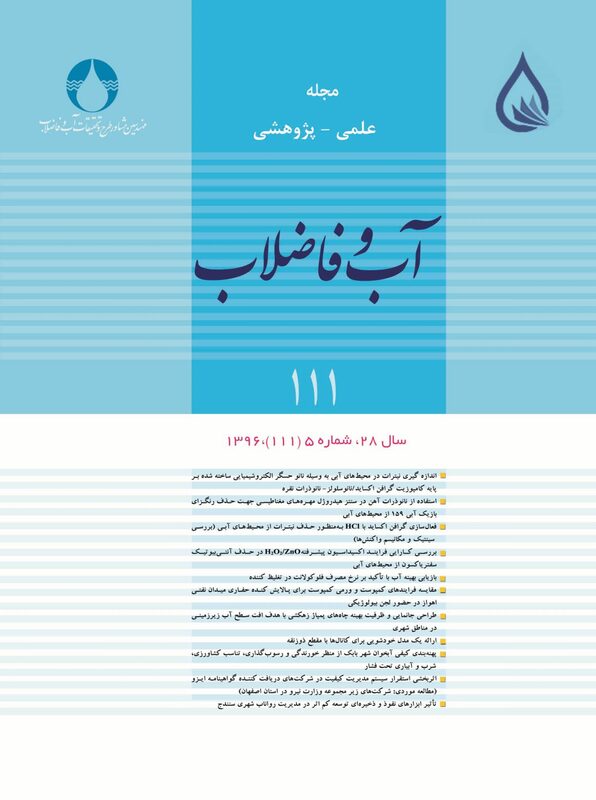 در این رویکرد تلفیق یک مدل شبیه‌ساز با قابلیت لحاظ جوانب مختلف سیستم آبخوان و یک الگوریتم بهینه‌ساز فراکاوشی با قابلیت نیل به مقادیر بهینه سراسری متغیرهای تصمیم، منتج به طراحی و جانمایی بهینه چاههای برداشت از آبخوان با هدف افت سطح آب زیرزمینی شد. High groundwater levels in urban areas pose major problems in construction and mining projects. A typical and effective solution in these situations is to dig drainage wells to lower the water table to the desired level through an appropriate pumping strategy. Although the method is efficient, the operating costs are relatively high and it is, therefore, of great importance to optimize the groundwater pumping system to save costs. In this paper, a simulation-based optimization approach is exploited to minimize the total costs through optimizing the layout and capacity of pumping wells. For this purpose, MODFLOW, the groundwater simulation software, is used to investigate aquifer behavior under pumping wells and the well-known Firefly Optimization Algorithm is exploited to find the optimal well layout and capacity. The proposed FOA-MODFLOW model is tested on the small urban ancient Grand Mosque region in Kerman City, southeast of Iran, to minimize the cost of the draining project. Experimental results indicate that the proposed cost-effective design noticeably outperforms the one proposed by the consulting engineers in terms of both the number of drilled wells and the associated pumping costs. The optimal strategy observes the constraints and demands by constructing only two wells with a total pumping rate of 5503 m3/day and a water table drawdown of more than 1.5 m provided the ground subsidence is within the allowable limit of less than 80 mm. Additionally, examination of the values obtained for the various design parameters shows that the proposed strategy is the best and its sensitivity to maximum permissible water level and pumping rates is highest as compared with other similar designs. Ayvaz, M., 2008, "A simulation/optimization model for the identification of unknown groundwater well locations and pumping rates", Journal of Hydrology, 357, 76-92. Bayer, P., Duran, E., Baumann, R., & Finkel, M., 2009, "Optimized groundwater drawdown in a subsiding urban mining area", Journal of Hydrology, 365, 95-104. Datta, B., Chakrabarty, D., & Dhar, A., 2011, "Identification of unknown groundwater polloution sources using classical optimization with linked simulation", Hydro-enviroment Research, 5, 25-36. Elci, A, & Ayvaz, M., 2014, "Diffrencial-evoloution algorithm based optimization for site selection of groundwater production wells with consideration of volnreability concept", Journal of Hydrology, 511, 736-749. Forth, R., 2004, "Groundwater and geotechnical aspects of deep excavations in Hong Kong", Engineering Geology, 72, 253-260. Guar, S., Chahar, B. R. & Graillot, D., 2011, Analatic elements method and particle swarm optimization based on simulation-optimization model for groundwater management", Journal of Hydrology, 402, 217-227. Karimipour, A. Rakhshandeh, R. & Banitalebi, G., 2012, "Evaluation of the effect of the drainage system for the groundwater level degradation in the Shiraz plain by PMWIN model", Journal of Water and Wastewater, Vol. 23 No 2 (82), 30-41. Mohammad Reazpor Tabari, M., 2015, "Conjunctive use management under uncertainty conditions in aquifer parameters", Water Resources Management, 29 (8), 2967-2986. Powers, P., Corwin, A., Schmall, P., & Kaeck, W., 2007, Construction dewatering and groundwater control. John Wiley & Sons, NY. Pujades, E., Vazquez-sune, E., Carrera, J., & Jurado, A., 2014, "Dewatering of deep excavation undertaken in a layerd soil", Engineering Geology, 178, 15-27. Wang, S. K., Wee, Y. P. & Ofori, G., 2002, "A decision support sysytem for dewatering systems selection", Building and Enviroment, 37, 625-645. Yang, X.-S., 2010, Engineering optimization an introduction with metaheuristic applications, John Wiley & Sons. Yuan, H., Gai-ling, Z., & Guo-yong, Y., 2009, "Numerical simulation of dewatering thick unconsolidated aquifers for safety of underground coal mining", Mining Science and Technology, 19, 312-316. Zhou , N., Vermeer, P., Lou, R., Tang, Y. & Jiang, S., 2010, "Numerical simulation of deep foundation pit dewatering and optimization of controling land subsidece", Engineering Geology, 114, 251-260.